I needed an easy cake for Elizabeth's 6th Birthday party. As I have said before, I am not a baker. I don't have the patience or the ability to measure accurately. I often leave out ingredients but I still like to "make" my kids' cakes. So, I am always looking for an easy dessert that seems homemade (like it's on my own plate) but really it took 5 minutes. So, an adapted angel food seemed perfect. Also, it's light and works with fruit so it was perfect for little girls who were already stuffed with pancakes and candy. This is beyond easy. 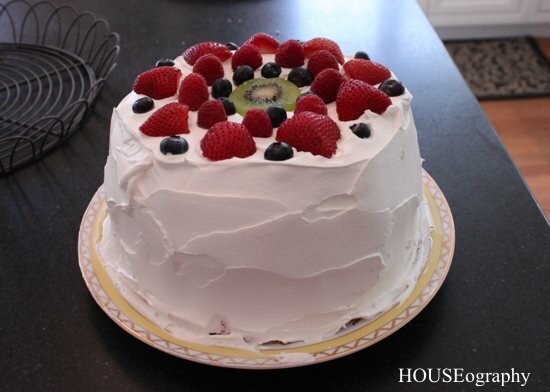 All you need is a store-bought angel food cake, fruit of your choice (I used strawberries, raspberries, blueberries, and kiwis. And Cool Whip (or whipped cream if you prefer but I love Cool Whip and so does my daughter! First, slice the cake in half horizontally. Set the top aside. Next layer on the Cool Whip and then a layer of fruit. I filled the center with Cool Whip as well. Maybe overkill! Layer more Cool Whip on top of that. 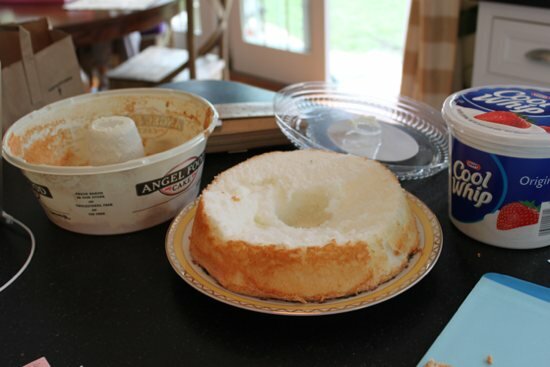 Finally, replace the top and cover the entire thing with Cool Whip as if it were icing. Decorate with fruit of your choice. Elizabeth loved it and thought it was perfect for her - my berry and kiwi loving girl!